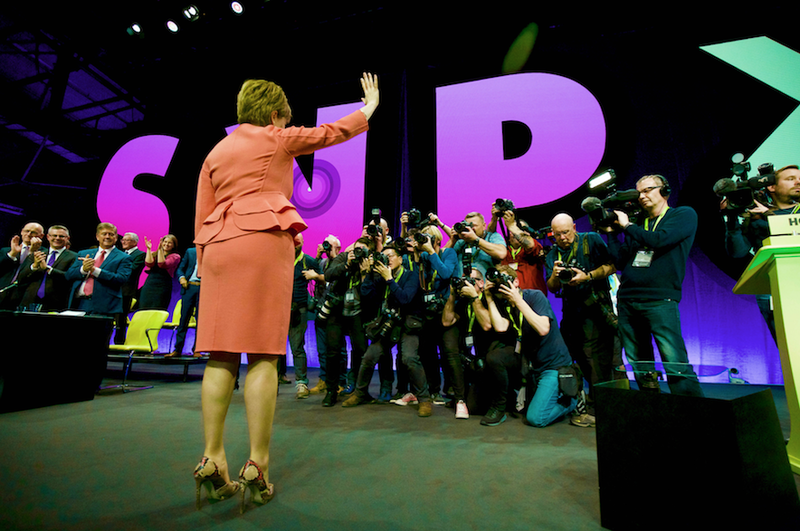 Nicola Sturgeon used her closing speech to urge SNP supporters to be patient in their quest for independence. The party leader and First Minister nonetheless dwelt on the subject, devoting a large chunk of hour long address to the subject without committing to any date for a referendum. She drew delegates’ attention to what she described as the “unfolding calamity” of the Tory government while offering an enticing prospect of an independent Scotland which was not so much a small country as a “big family”. Pointing to the in-fighting among Westminster parties and the slow progress towards a Brexit deal, she said: “That is why it is up to us – now more than ever – to offer optimism and hope. She said: “Just think how much more hope will be possible when we take Scotland’s future into Scotland’s hands and become an independent country. Contrasting her party’s values with the immigration policies of the Tories, she said: “In the face of rising prejudice and intolerance across the world, I am proud that our party welcomes those who come here from other countries. “To everyone who has chosen to make Scotland your home, no matter where you come from, let me say this again today. We value your contribution. Ours is a better country for having you here and we want you to stay. “And to the Prime Minister, my message is blunt. It is great that the son of an immigrant is your Home Secretary. She confirmed that the SNP would support a second referendum on Brexit, but added a note of caution. “In recent days, we have argued for the Article 50 process to be extended to allow disaster to be averted,” she said. “That would allow more time for a sensible single market option to be pursued. And it would allow time for another vote to take place. On that, let me make our position clear. If there is a proposal for another EU referendum, SNP MPs will vote for it. Making a deliberate link between Brexit and independence, she said: “Brexit is a serious problem for Scotland. Accepting that hearts and minds still had to be won over, she said: “To those who say there is no demand for Scotland to have a choice over our future, I say the polls and the people are telling a different story. “Our job is to take that passion and blend it with pragmatism, perseverance and patience to persuade those not yet persuaded. “If we do that, then believe me – the momentum for independence will be unstoppable. “As we wait – impatiently, at times, I know – for this phase of negotiations to conclude and for the fog of Brexit to clear, be in no doubt about this. “The last two years have shown why Scotland needs to be independent. And I am more confident than ever that Scotland will be independent. “Our task now is to step up our work to update and strengthen the case. The Sustainable Growth Commission set out the opportunities that are there to be grasped in an independent Scotland. “We must show people that with the powers of independence we can fully realise our country’s vast potential. “So, yes, let’s debate Scotland’s economic future. Let us address concerns and answer questions. Ms Sturgeon said Theresa May had made a big deal about lifting the borrowing cap on local councils. “The SNP has never applied a cap in Scotland,” she said. “Which maybe goes some of the way to explaining this quite remarkable fact. She announced that in the fight to combat homelessness, the government has joined forces with the Social Bite charity and will increase its investment to £6.5 million to help 800 people out of homelessness for good. Aside from criticising the Tories and Brexit, she accused Jeremy Corbyn and Labour of delivering an “SNP policy tribute act” during its own party conference. “So here’s an offer, Jeremy. You say you want to bring water into public ownership. The next time you’re in Scotland, I’ll show you how to run a public water company. “And while you’re here…I’ll show you how to abolish prescription charges. I’ll show you how to get rid of tuition fees. I’ll take you to Dalzell steelworks or the Fort William smelter to show you how to deliver an active industrial policy.